It seemed like the whole of May was blighted by strong, cold winds, so I for one am pleased we are now into a new month. June is traditionally one of the best months on the Bristol Waters, but it'll have a hard act to follow the sport and weather we had in March and April! Perhaps the seasons really are changing. Despite the windy weather, we still had great fishing at times, especially on Chew. Last week, 2 of my clients; Michael Ruthven and Bill Tucker, enjoyed their best ever morning session in Herons Green, with both anglers taking limit bags before 2:00pm using teams of Diawl Bachs and Buzzers. Plenty of boats drifted by, just catching the odd fish, while Bill and Michael frequently had fish on at the same time. Speed of retireve was critical - nice and slow, with floating lines - not midge tips. Behind Denny Island has been the best area recently and we have taken fish in just 2 feet of murky water - amazing! The rainbows are fighting harder than I can ever remember and good quality Hardy Mach or Rio Fluorocarbon in 8lb BS is essential. Avoid the finer diameter fluoro's as they simply cannot cope with the savage nature of the Chew Trout at the moment - the knot strength is not good enough. I wish I had a pound for everyone that has told me their expensive fine diameter fluoro has broken lately! The trout are now moving around from Denny Island and the spit off Denny is starting to produce good bags of fish for the first time this season. Weed growth and water levels. Chew is about 5 feet down and the weed growth is already prolific over the Roman Shallows, Herriots and Nunnery Spit. Strangely enough, the shallow bays by Hollowbrook and Herons Green are not infested yet and the trout are feeding avidly there on either bloodworm or huge black buzzer. Trout on the major reservoirs appear to hate weed with a vengeance and I never find them feeding or even swimming- around it. Sometimes they feed on the edge of weedbeds, but even that is severely limited. If the weedbeds get as dense as last year, then I fully expect the rainbows to leave those areas and populate the non weedy places - areas such as Whalley Bank, Woodford Bank, part of Villice and the Sailing Club - in fact, exactly the areas they could be found in huge numbers last season. These places have very hard clay bottoms and weed growth is never a problem. Next week, I will be away on Loch Harray in the Orkney Isles, fishing for England in the Spring International match. We have 9 new caps in our side, but all are seasoned competition anglers and almost household names. I am the Player/manager for this match and Clive Collier is Captain. Andy Haskins, Si Morris and Alan Williams are the other experienced caps. 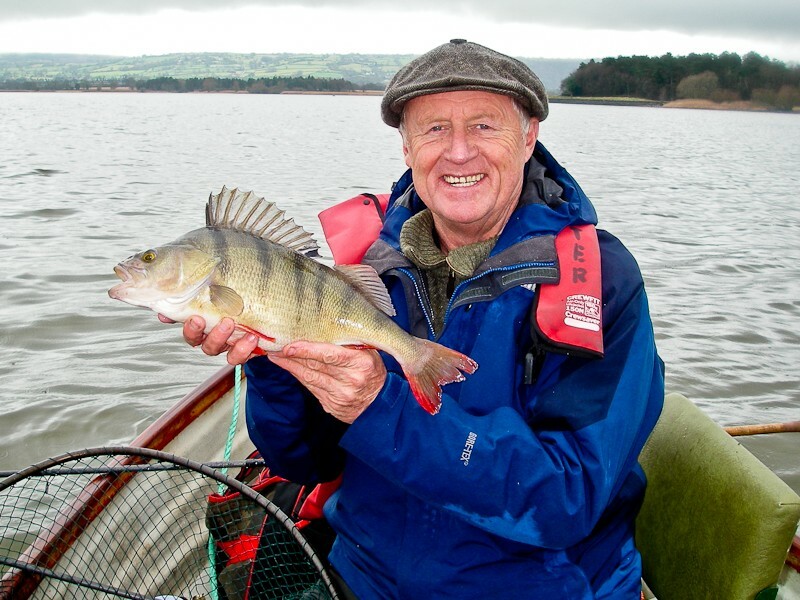 Ex Lexus Champion Lloyd Pallett is a new cap, as is regular Trout Fisherman Magazine contributor Leigh Pond and England Rivers International angler Keith McAdam. Well known match anglers John Calvert, Harry Fox, David Wortley, Jim McGonigle, Paul Kitchen, Andy Croucher and Bob Shaw make up the rest of the team. Harray is 6 miles long and 1 mile wide, so we will need as much practice as possible - hence the need to be there for a full week. Our Team Coach is ex England International Captain Brian Thomas who now lives on Orkney in the quirky named village of Twatt! Brian is an expert on many styles of loch style fishing and his knowledge will be invaluable. The Scots team have to be the bookies' favourites due to their local knowledge, but the Irish are used to fishing for wild browns on their own Loughs and the Welsh Team are travelling up today to practice longer than any other team. So all in all, it looks like being a fantastic match with plenty of top name anglers and ghillies alike. All we are hoping for is some decent weather and no gale-force winds that could force the match to be abandoned. The Chew pike have been active of late and I have had some great sessions, catching lots of fish - best last week from 8 twenties being Justin Whitfield's 22:08 fish. I have also been reapturing some of the near 400 pike that I have tagged and am surprised to see that most have put on less than 2lbs in weight in a whole year! I see plenty of pike anglers out on Chew nowadays fly fishing for the pike. This element of the sport is certainly one of the only growth areas and with sensitive management by the fishery; is a welcome addition to our fantastic sport. Just one tip to some of the many pike fly anglers out there and struggling at the moment - SLOW DOWN and SCALE DOWN! I love all species of fish that can be caught on a fly - be it perch, roach, pike, grayling, carp, barbel or trout. My best ever roach weighed 3lbs 4ozs and took a Diawl Bach Nymph while bank fishing off Moreton - the angler next to me, when told it was 3lbs 4ozs shouted back "yeah - Fxxxing things"! I also sadly remember the days when trout anglers on Chew threw their perch up the banks in disgust - much the same way that river anglers have tried to obliterate the Grayling for so many years. Let's not make the same ignorant mistake with the pike. To date, I have had 18 trout with cormorant marks and just 6 with pike marks. This figure will probably change as the majority of Chews several hundred cormorants are away from the lake as they breed - prossibly off the Pembrokeshire and Western England coastlines. If I can get an internet connection on Orkney, I will update my blog during the week - but don't expect any secret flies or methods from the Loch - all will be revealed after the International! When will this spell of strong, cold, North Easterly winds stop? Coupled with constant bright sunshine, this has to be the worst conditions for trout fishing. The Chew and Blagdon trout hate these conditions and when I was at Rutland Water last week, their trout responded by going off the feed. The last 2 days on Chew have been very tricky, with deep fished nymphs the only way we could catch during the sunny, windy weather. As soon as the winds dropped for a while, Herons Green came back on and the fish started to feed on the almost instant buzzer hatches. Still, we must not complain - the opening month has been amazing, thanks in a big way to the light winds and warm air temperatures - I suppose we were due for a change. The forecasters predict lighter winds as we approach the weekend and I fully expect the Bristol water trout to respond by feeding on the buzzer and daphnia and coming much closer to the surface again. Just have a look at the size of the bloodworm and buzzer present in one of my Chew trout yesterday - if you look carefully, you will also see Hoglice and even Shrimp - these show how deep the fish have recently gone. The pike fishing with fly on Chew has started to improve, with lots of follows and many smaller fish. However, Seb Shelton recently had a 27lb 8oz fish and one of my clients; Andrew Cadman, caught this cracking 24lb beauty. I am keeping count of the marked trout I am catching this season and so far, it is very few. Just 3 pike marked fish and 13 cormorant marked trout from around 150 landed (and many returned). Most of the cormorants have left for the coast to breed and the pike are obviously feeding primarily on the many roach that I have already seen this season. The Swifts arrived at Chew on Friday and by Saturday, there were hundreds chasing the buzzers! I still haven't seen a house martin on Chew, but saw loads at Rutland last week. No less than 14 buzzards were on a thermal above Chew last week and I think I spotted my first Hobby last week. At times, there are more than a dozen Shelduck feeding on the buzzers at Chew. 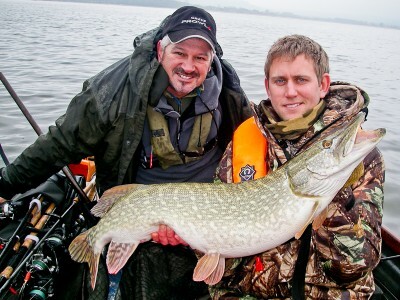 Warren Dyson started our day on Chew with a bang by landing a superb 23lb 12oz pike on the first drift. This is his personal best pike on a lure - which happened to be a Silver Professor Kusami Spoon - the same lure that accounted for Chris Tarrant's 27 lb pike in the Autumn Chew Pike Trials. The weather today was great for fishing - overcast skies and light winds - the rain spoilt things at times, but for February, this had to be almost perfect - pity the pike didnt agree though! Most of the bait anglers struggled to put together a few jacks, but the 3 boats that constantly drifted, using assorted lures, were rewarded with plenty of action. The water is clearing and Chew Valley is filling - at last! 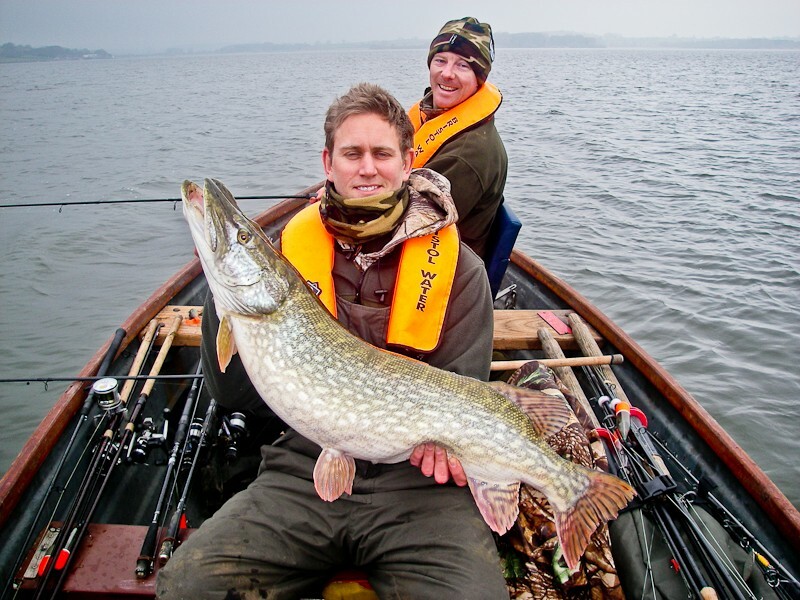 And what's more, the big pike are now hitting the lures as well as we soon found out! On Monday I was guiding Rob Johnson and Paul Mersh - 2 very experienced predator anglers experiencing Chew Valley for the first time. We had a great day. Rob's first fish was a stunning 22lb 12oz fish that smashed into his soft plastic lure. I've been out twice in the 1st session with clients. Day 1 was cancelled due to high winds which really ripped the water into a muddy mess. I was out on Day 2 with Daryl Hunter who landed his first pike of the day within 10 minutes. The fish took a deep fished soft plastic lure. Daryl also landed another couple of fish but alas, no biggies! The next trip was with Chris Tarrant and his good friend Sean - they both had several small pike, but nothing over 10lbs. However, the highlight of the day was another personal best fish for CT from Chew - a cracking 3lb 8oz Perch taken on a 5 inch Silver Spoon fished ultra slowly along the bottom. I am out with clients again this week and will report back - already there have been pike of 38lbs, 34lbs and at least 4 others over 30lbs have been landed. It's looking good for a 40 pounder at this rate and who knows, maybe my boat will get it.